Clinics — the university said. 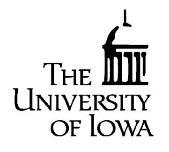 A five-year contract with the University of Iowa Community Credit Union expires Dec. 31.
surcharge-free ATMs will remain surcharge-free. account, which enables them to use their card for ATM and PIN-based debit transactions,” the university said. Five financial institutions submitted proposals, according to the university.